It seems that the vast majority of craftsman/urethane kits have been focused on the steam era. 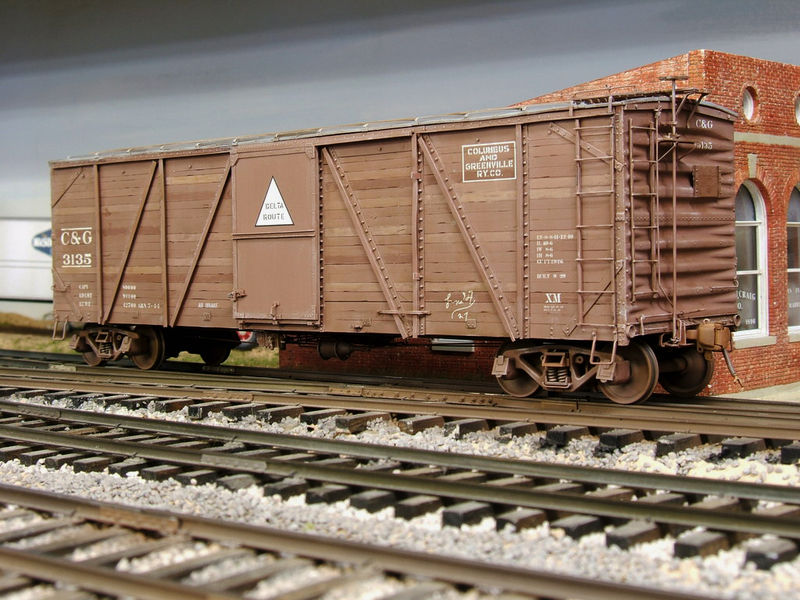 Bill Yancey has changed that paradigm with the launch of his new 50 foot FMC boxcar kits. His company is Modern Era O Scale. He has invested a lot of time into making superb patterns and having them cast by the best foundry in the US. The result is a product that will grab your attention. This series of FMC cars are common in the modern railroad scene. The Western Pacifc car was assembled and finished by Bill. He used a novel technique for finishing the car. Bill learned about using gouache at the Bridgetown RPM meet held in Portland,Oregon. Here are his words describing his method. Gouache is an opaque watercolor. It comes in tubes and available at your local art store or online. He used 4 colors: black; burnt umber; burnt sienna; and orange. To keep them from just beading up, you paint them on at full strength. Bill has had the best luck using an artist brush called a ‘filbert’. It is stiff bristled and rounded. Then you use a lint free cloth to start wiping the paint down until you have the weathering you like. The great thing about gouache is that it’s completely reversible. You can then overspray with Dullcoat. Then you can add more weathering if desired without disturbing the weathering already done. I have a tendency to accidentally over weather. Being so easily removed has been a big help in mastering the technique. The kits can be puchased from his website and are sold less decals, couplers and trucks. There are different configurations available. The prices is $160 plus shipping. 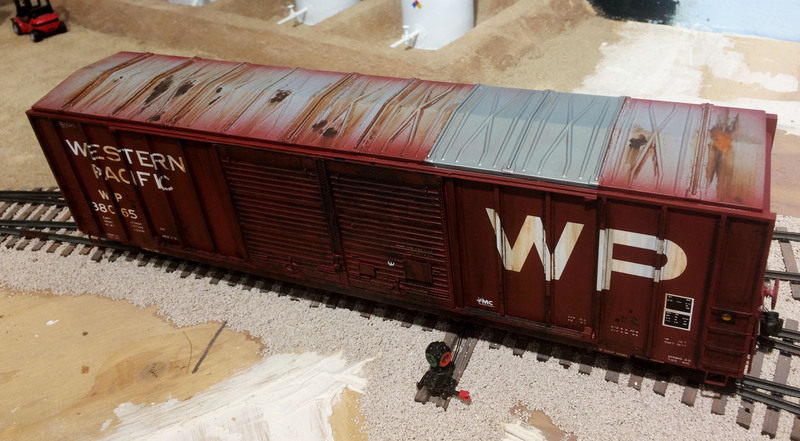 Jimmy Booth tried his hand at the kit finishing it with an extreme weathering job. Paint failure was done with hairspray I believe. FM, F32, GLa, GS, K7a, XL and X23 through X36. In some cases these trucks replaced 2D-F8 trucks which had all coil springs. The truck has a uniform bolster height which makes it easier to upgrade existing cars in your collection. It is a very clean set of brass castings assembled with care and mechanically sound. The trucks sell for $52.95 plus postage. They can be ordered via the Protocraft website. Speaking of Protocraft, Norm recently posted a bunch of new decal sets. There was a backup at Microscale due to a very large order of airplane decals for someone in the UK. Things are getting back to normal in terms of turnaround. 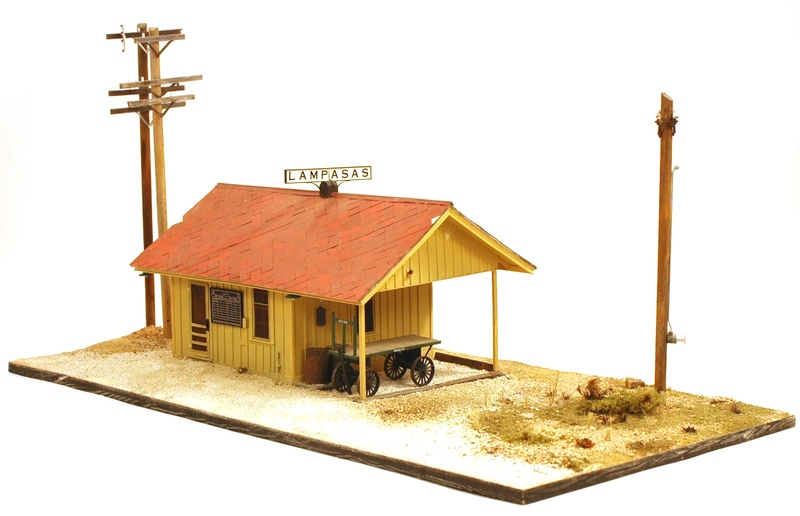 A new resin kit supplier has entered the scene. They are Twin Star Models. Their first offering will be a 53′ steel flatcar once owned by the Rock Island. The railroad spiced the cars to add length to fifty-three feet. Here is a sample of what Twin Star is doing. This a shot of the uerthane deck for the kit. It is far and away the best “wood” deck I have ever seen. Can wait to throw some weathering on this beauty. You will be able to see the pilot model for this new kit. One of my all-time favorite steam locomotives is the Katy 4-4-0. Specifically, a model that Bruce Blalock owns. Bruce is a lifelong Missouri-Katy-Texas Railroad fan and a very knowledgable historian. The model is custom built masterpiece done by Kelley Morris. 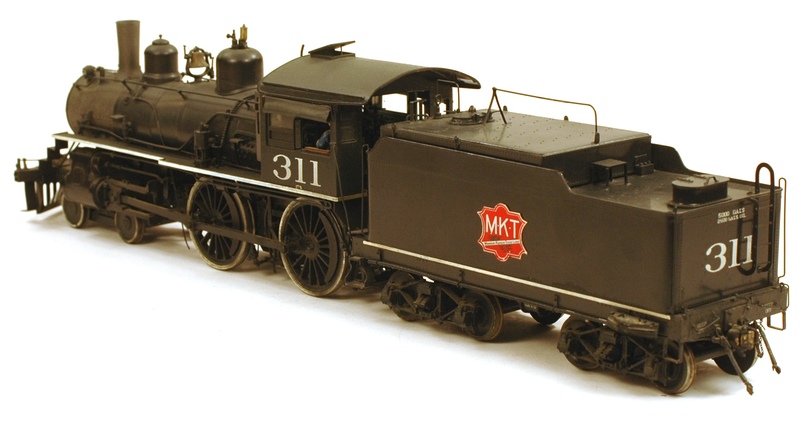 Bruce commisioned Kelley to create a 1/4″ scale model of his favorite locomotive. Kelley is professional model maker and owns Kelley Morris Models and Miniatures. I reached out to Bruce to supply some photos of this wondeful locomotive. He was in the process of taking pictures for a clinic he is presenting at the Katy Historical Society convention. Bruce supplied the photos and a little background to go with it. The 311 and some of others were retained for branchlike passenger service. 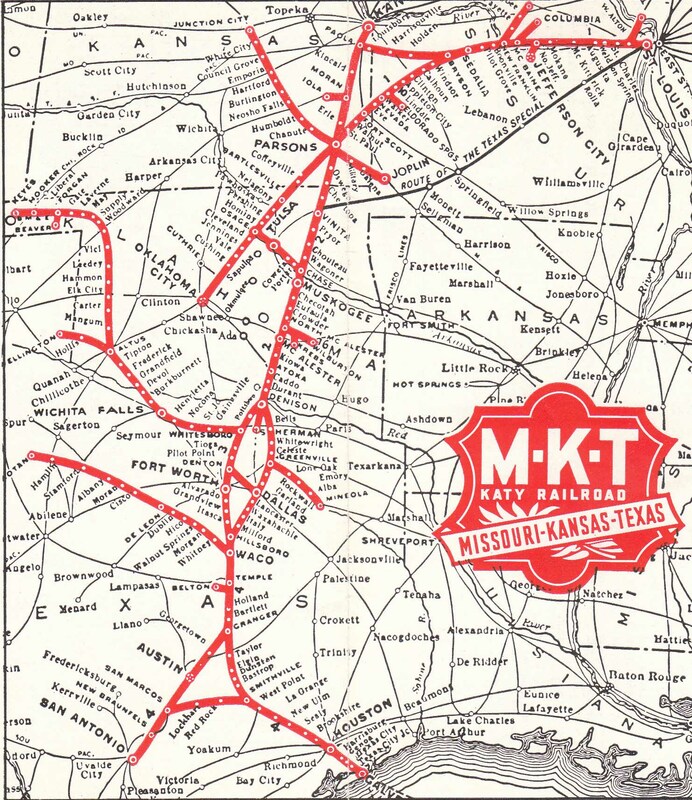 The two significant areas were Wichita Falls north (trains 53 and 54) and Waco west (trains 35 and 36). In Texas the consist was a 70’ RPO and a 60’ wooden coach made from a combine. I have one about 1/3 finished. They were renumbered in four digits to have the 300 series available for diesel numbering in 1949 and were out of service by 1950. 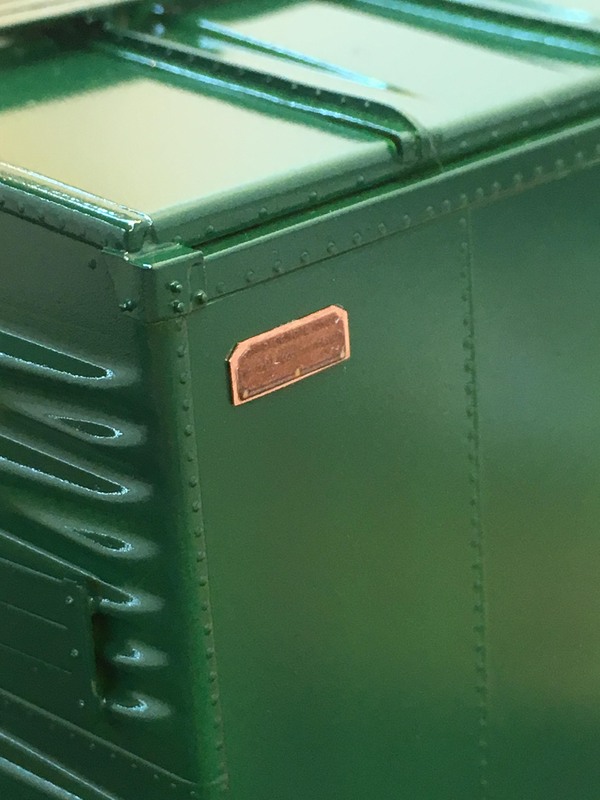 The 311 was retained by the Katy for a museum train which was donated to the St. Louis Transportation Museum in 1952 and it is the only surviving Katy steam engine. 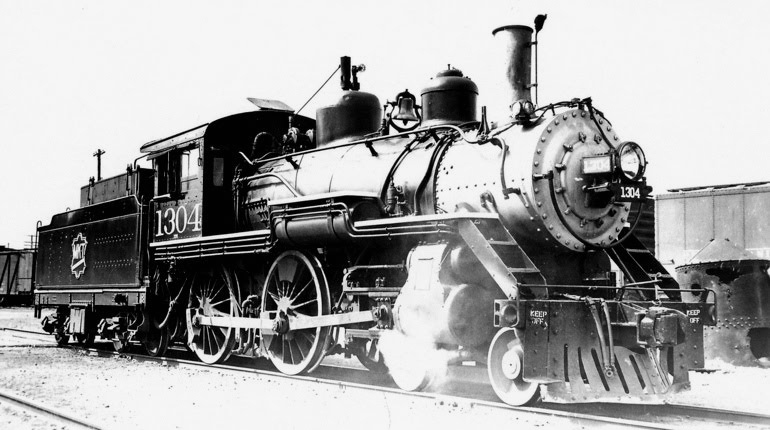 The E-3 class of engines were built by Baldwin in 1890 and rebuilt by the Katy shops in 1924. Rebuilding is a funny word. The only pieces that I’ve determined that were from the originals were sand domes and tender trucks. They got new boilers from Alco, new longer frames and new, larger diameter drivers. I’m sure there were tax credits to rebuild rather than replace. Thank you Bruce for sharing your beautiful American. I have made a little progress on constructing the vintage (2006) Chooch Ultra Scale II kit. The car is getting closer to going into the paint booth. It is always motivationaly refreshing to get paint on the model. I find my enthusiasm tends to hit a low point about this point. The smell of the lacquer fumes gets me charged up to throw some decals and weathering on the car. Satisfaction of viewing the completed model is what we all seek (I think). The primed model is very close to the final finish. I will show you some the things I did to get it to this point. I decided to build the model with a partially open door on one side. I find that building up the area behind the urethane door provides better support for the door and a larger bonding surface. 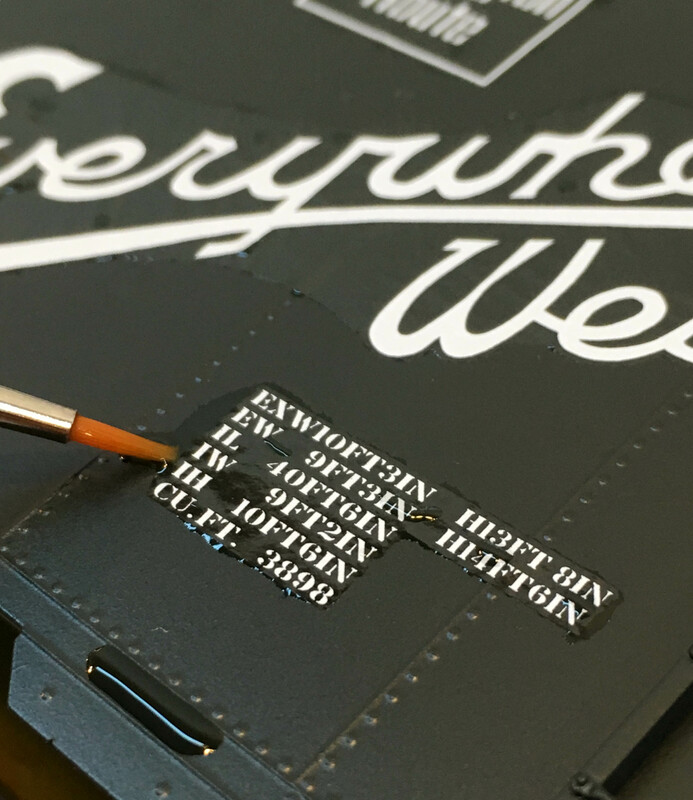 Detailing the side can start once the doors are in-place. The Camel door hangers are installed along with the stops. The door guides are installed next. They are very fragile and can easily be snapped off. I painted the gap in the door opening to see if it will give the illusion of a dark inside. The fully detailed “A” end with all the Camel hardware is complicated but fairly quick to complete. The plastic latches turned out a bit short when tooled. The kit should have enough parts to splice the bars and extend their length. 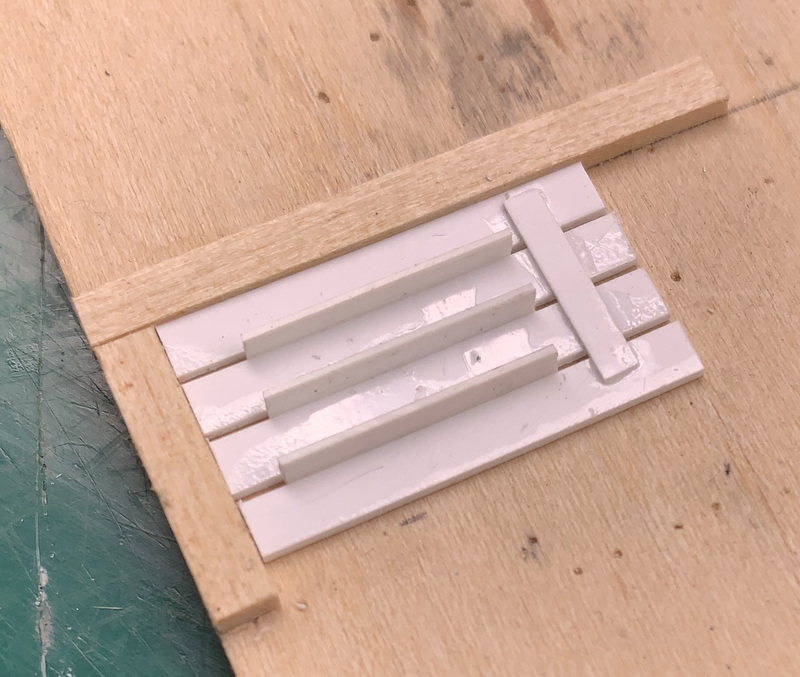 A little plastic putty fills any gaps or seams left from the splice. You may have noticed the foam pad under the car. I like to place the model on something like this while detailing the model. At this point I shifted to the running board construction. 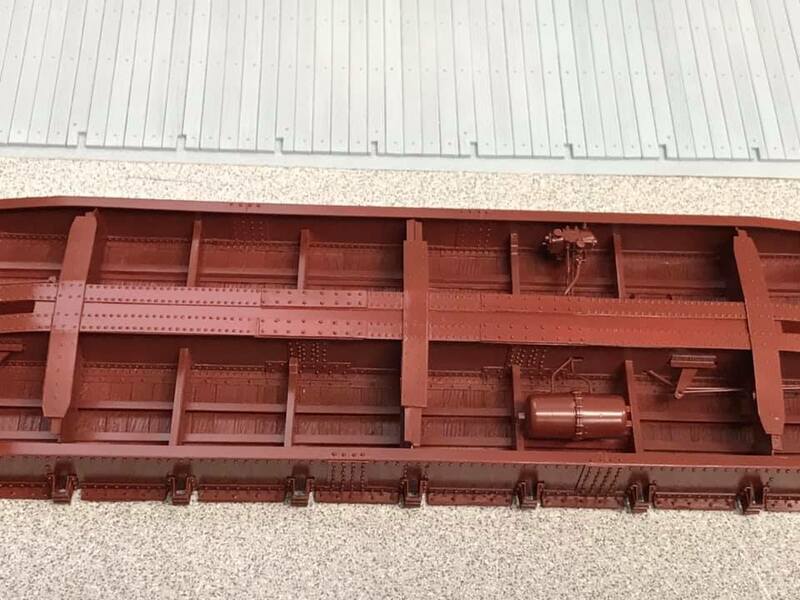 Running boards scale out to be .025″ thick. 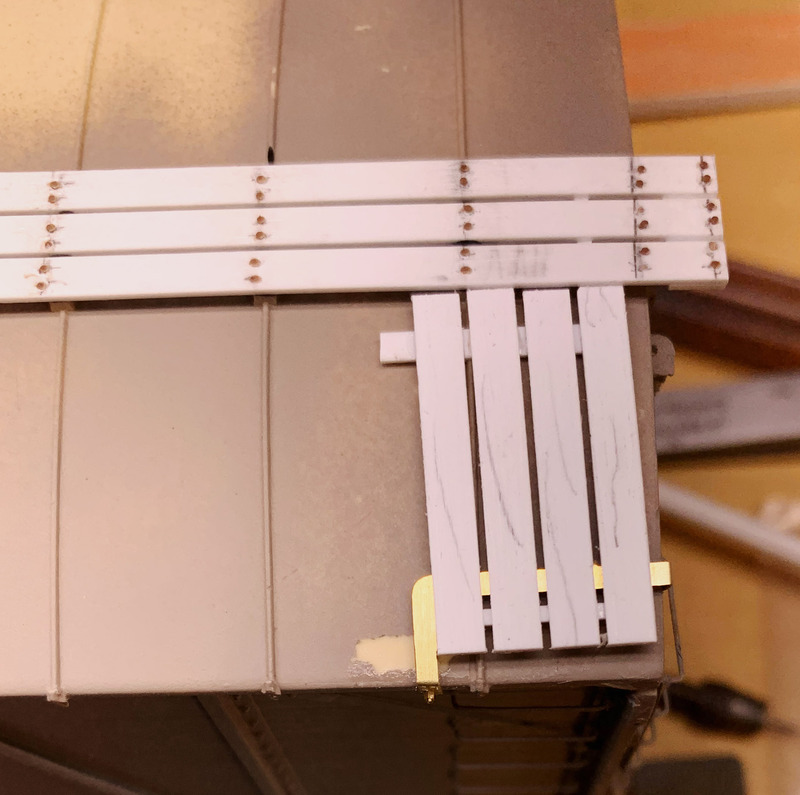 You can buy styrene strips with this thickness so just laminate a .015″ and .010″ using a solvent-based glue like MEK (except in California) or Tamiya Super Thin. 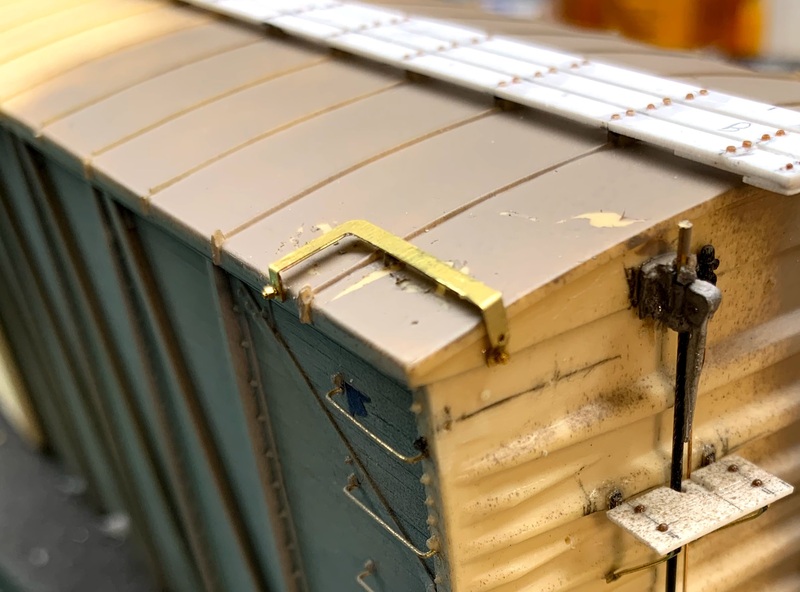 I like to use Tichy .020″ rivets to simulate the carriage bolts used to attach the running boards to the roof. Once installed I will go over with fine sand paper and greatly reduce their height. They will be less obvious once painted. My poor drilling will be less obvious is what I ment to say. 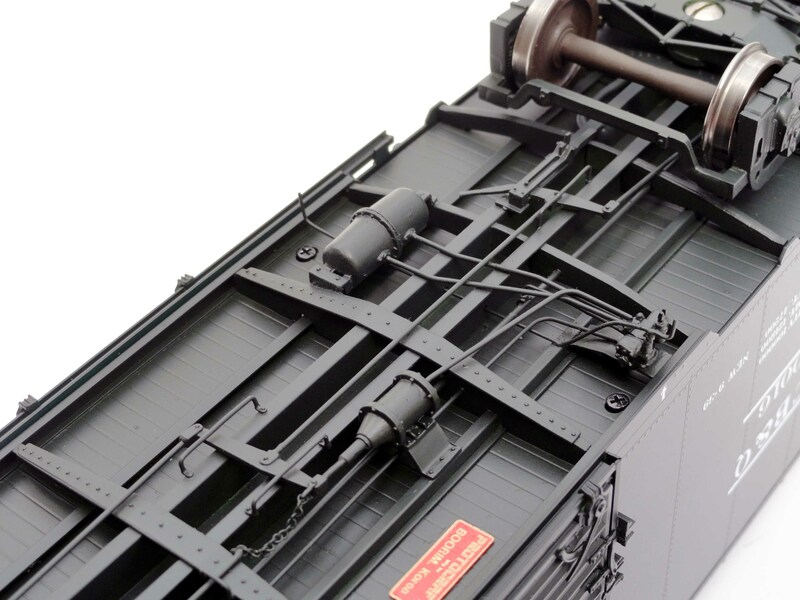 The Northern Pacific used a different style of lateral running board on their wood cars. 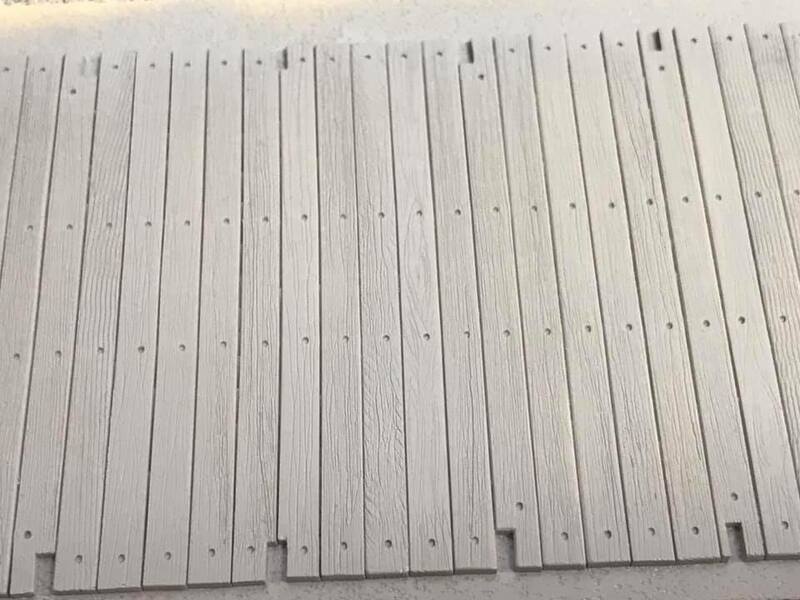 The boards are oriented crosswise rather than the more tradional configuration. I use the .025″ laminated material to build up the laterals. Assembly is quite easy with a simple jig and some .020″ spacers. I add straps to the underside to hold the boards into an assembly. 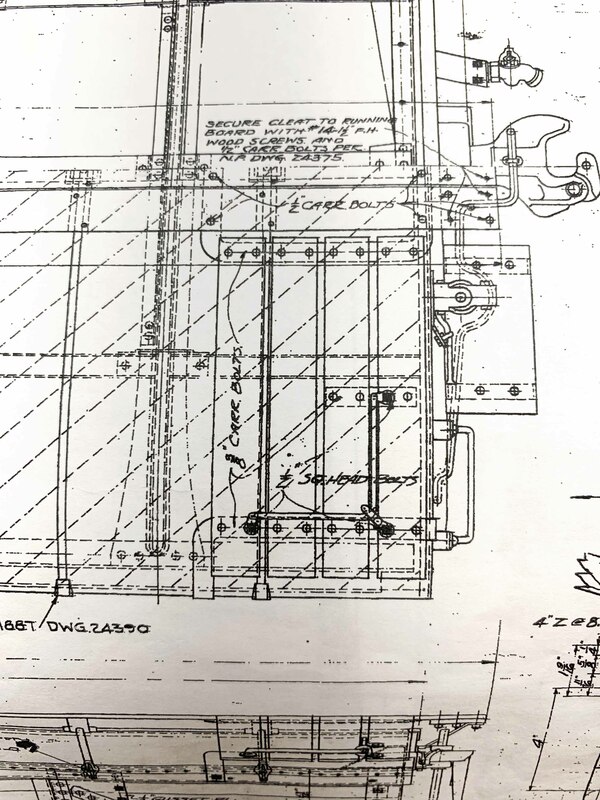 I have included an excerpt from the general arrangement drawing to show position of the grab iron and bolts. 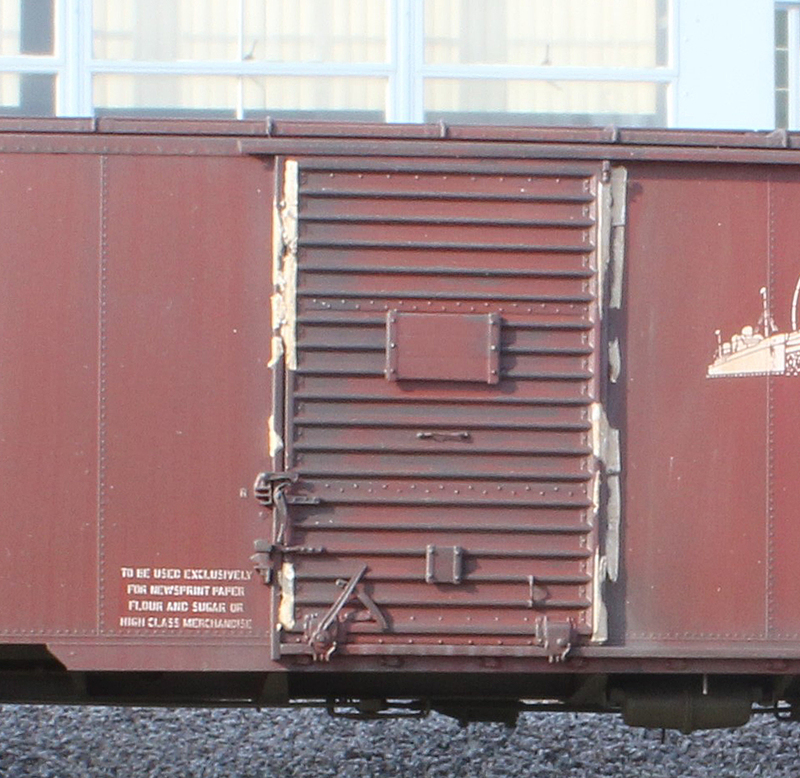 You can also see the steel straps used to support the lateral running board. 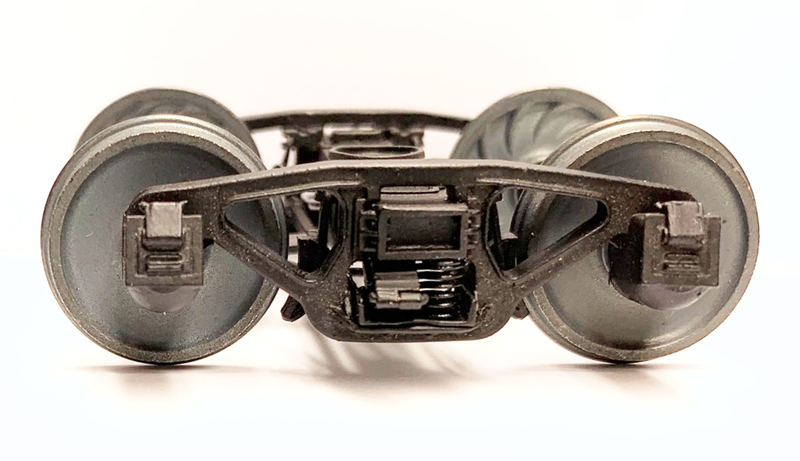 The kit provided injection molded laterals that are too short. 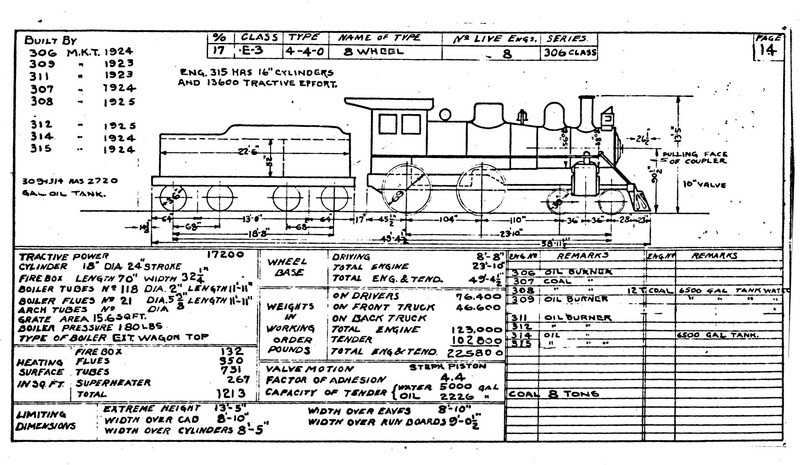 They were tooled for one of the earlier Chooch NP kits. That is why I had to do my own. The boards need to be 48″ long. 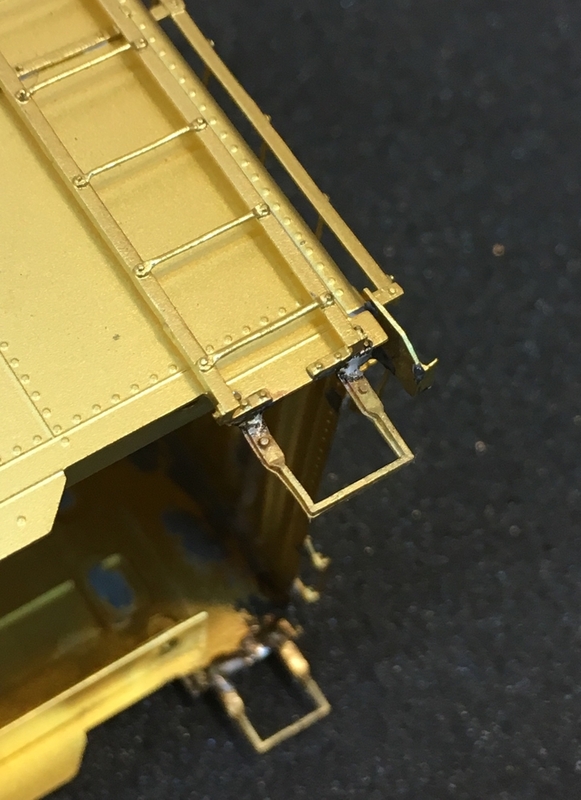 I used an etched brass part to create a support for the lateral running board. 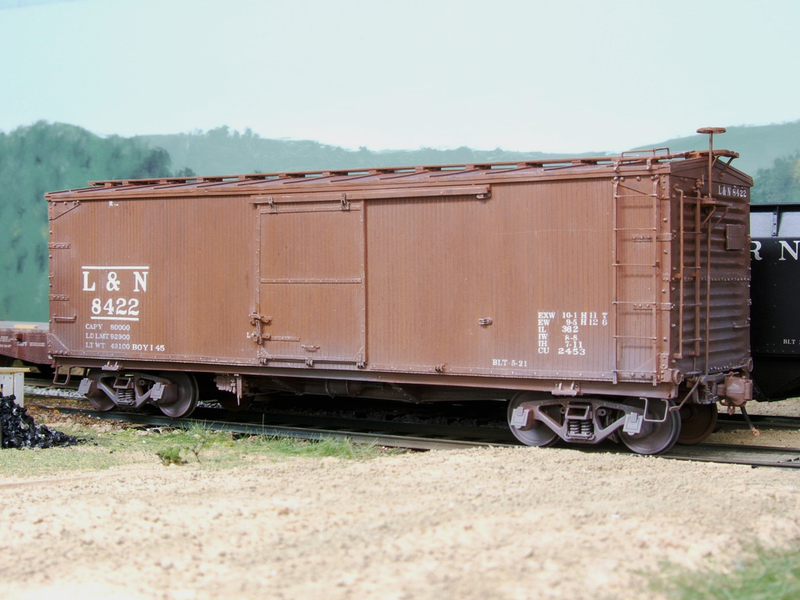 It was designed for a 10,000 series NP boxcar but it seems to fit the car well. A friend had a bunch of little parts etched for NP cars several years ago. Sadly, the etching company burned down and the gerber was lost. I wish that I had a few more parts…..
Well, this concludes this chapter of my build. Next time, I will have paint and a brand new set of Protocraft decals just released for this car. after being applied. Many roads did this outside in rain or snow or whatever. Some white wash was used to show the lettering bleeding. 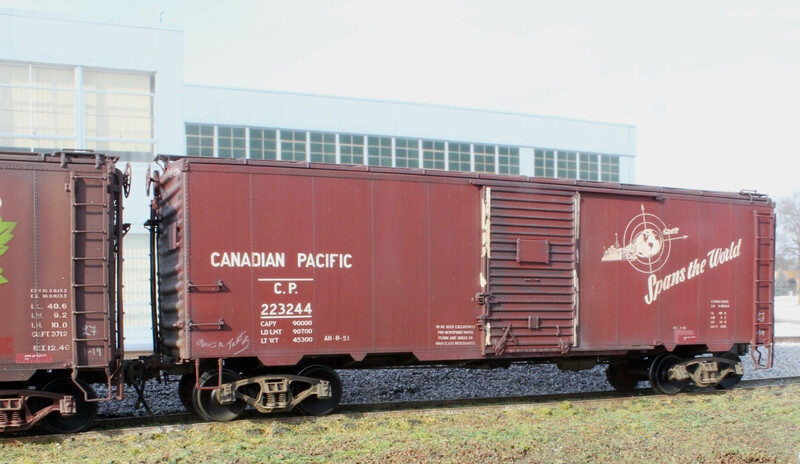 The CP car was painted with Model Master Rust, Rot Braun and some Guards Red.A lighter coat of Dark brown wash was done to the sides and even more was cleaned off just leaving a hint of shadow. Then a light brown wash (Vallejo European Dust) was applied from an almost dry brush in vertical streaks. Lastly the rivets and seams were dry brushed with Vallejo Dark Rust. Once again the lettering was cleaned up with a micro brush and Mean Green. Finishing touches were re-sprayed repack patches, remains of paper door seals on one door and remains of a paper grain door behind the other door. The door seal paper residual is made with cigarette paper like the brand Zig-Zag. I suspect that most purchasers of Zig-Zag never though of using it to simulate door seal paper. Lee Turner is a resourceful modeler who has innovated many techniques for modeling. The paper is very creative. 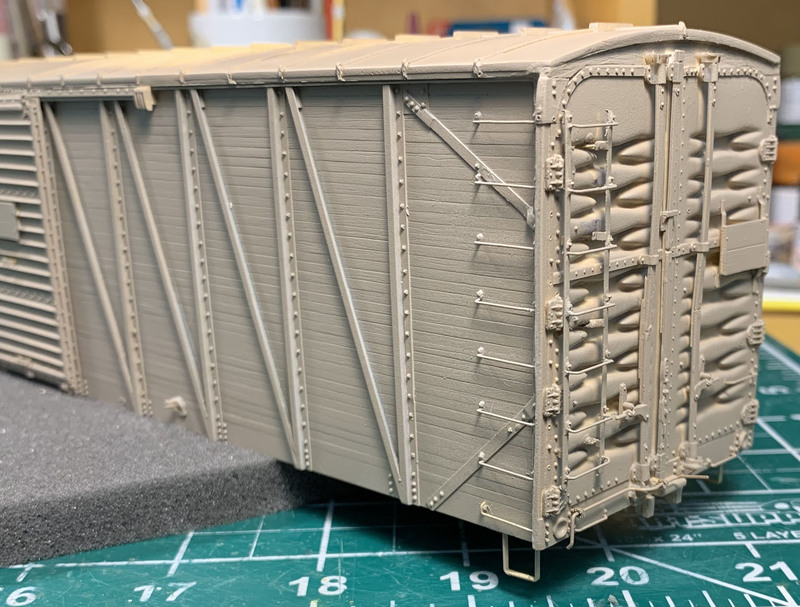 By the way, the boxcars are imports from Protocraft and are based upon the 1937 AAR design with a Murphy flat roof, Dreadnaught ends and sill steps on the end ladders. The Canadian roads bought huge numbers of this design. Thank you Lee for sharing your art with us. 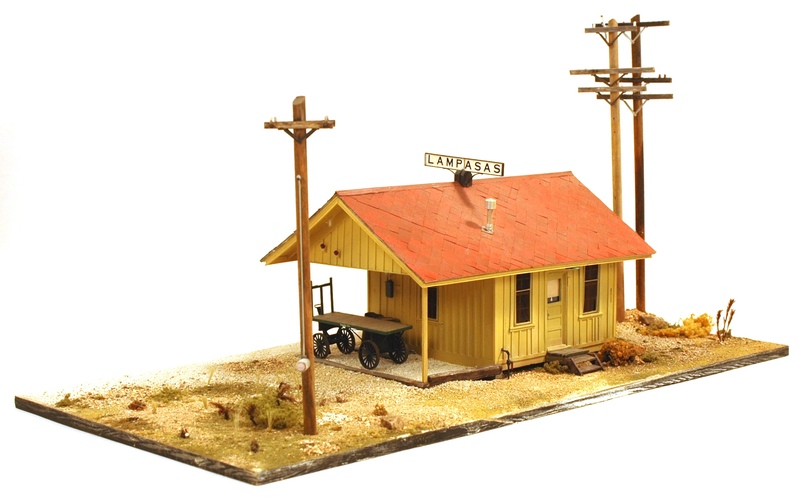 Bruce Blalock’s days attending college at Texas Tech were brought back into focus when he received a scratchbuilt model of the Lampasa depot. The late Jim Hickey built the model from stryene based upon his visit to the site. 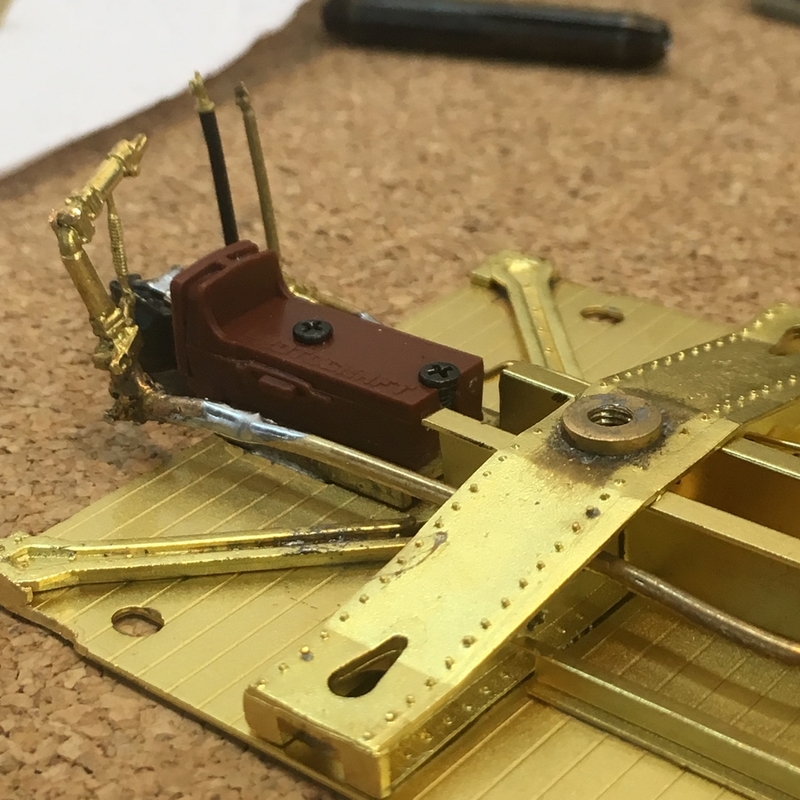 Jim gave the 1/4″ scale model for helping with the disposition of his collection. recalls his college days traveling to Texas Tech. Bruce has shared his stories of train trips in the 1960s. He also took the photos shown in the posting. Until I went off to Texas Tech I lived in Burnet, Texas. Lampasas was 22 miles north of Burnet and the Santa Fe grazed the North side of town. There was a wye where the line went into town, named Radio Junction, which had a passenger shelter. 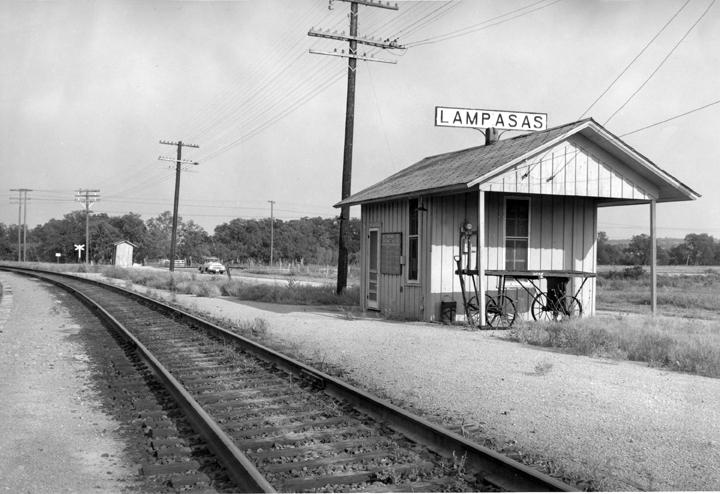 In older days, the passenger trains would actually go to the Lampasas station, then go back out to the main. By the 1960s it was a flag stop for the California Special, Train 75 and 76, and the few times that I rode westbound to Lubbock the nighttime drill was: point the auto east and when you saw the locomotive headlight, flash the car lights and the engineer would stop. Then you would board, pay the conductor and wake up in Brownwood where four passenger trains met, switched and go on their way. You would then wake up around Slaton to the scent of Santa Fe’s special blend of Chase & Sanborn coffee with ham and eggs cooked over charcoal. Arrival time in Lubbock was 0715 with westward train departure at 0730. The arrival time meant one could make it to an 0800 class, usually well rested. At Brownwood, the California Special, 75 and 76 interacted with trains 77 and 78, Dallas-Fort Worth-Brownwood-San Angelo. They interchanged cars and units in the wee hours. No. 75 also picked up a T&P mail car at Sweetwater and set it out at Lubbock. Also 75 and 76 connected at Lubbock with trains 93 and 94, Lubbock to Amarillo. It was a good time to see Texas passenger trains. It seems like there were always Houston-area Texas Tech kids on the train, especially around holidays, along with other colorful characters. One of those whom I met was Haystacks Calhoun, a professional wrestler who weighed over 600 pounds and could barely go between cars. Haystacks wore a heavy galvanized chain necklace over his overalls and wanted to play cards. My money was appreciated enough that I didn’t want to give it away, so I didn’t play. 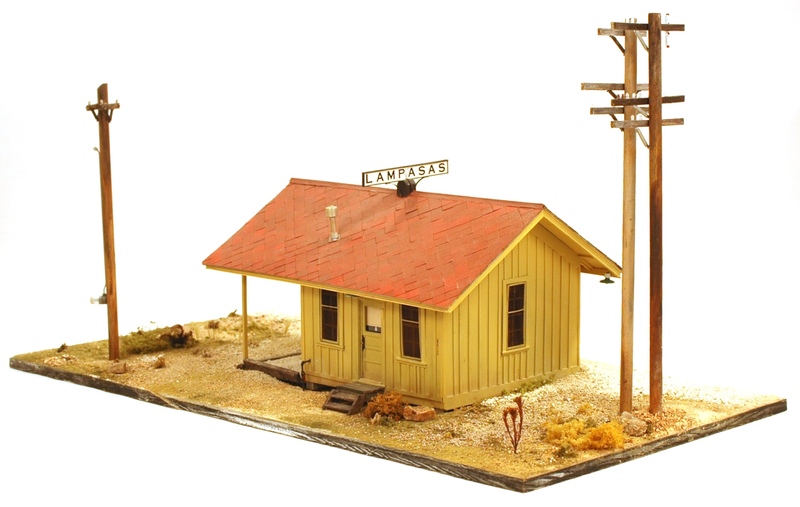 The wonderful model of the shelter by Jim Hickey in O Scale is complete in every way, right down to the schedule on the train bulletin. It also has the replacement telephone pole added just like it was on his visit with the fresh dirt and all. The building was moved to ranch of Lloyd Lively near Lometa and converted to a cabin for deer hunters. Unfortunately it was demolished in 2003. 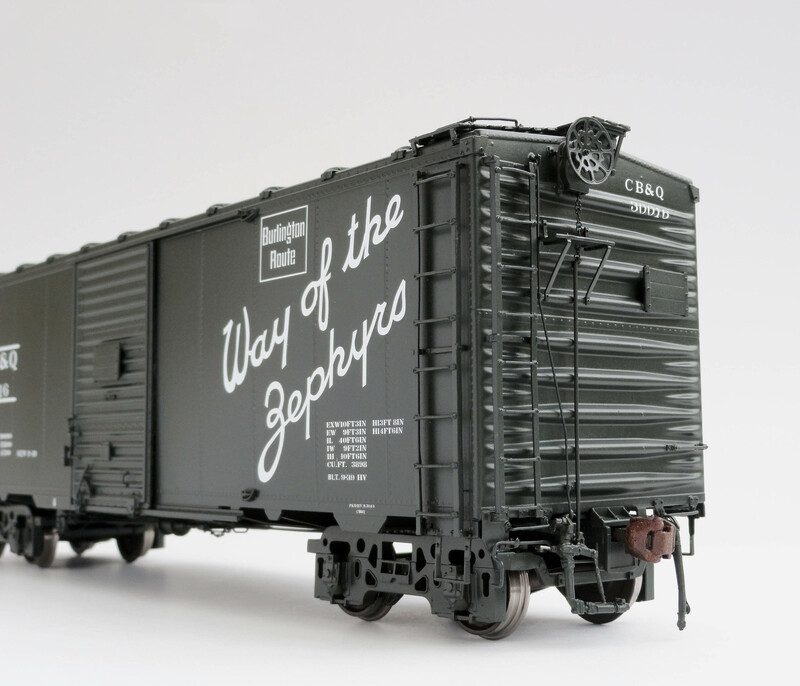 By the way, the baggage wagon is of a “high type” that was designed for loading caskets. For those of you who do not know Bruce, he is a lifelong lover of railroading. 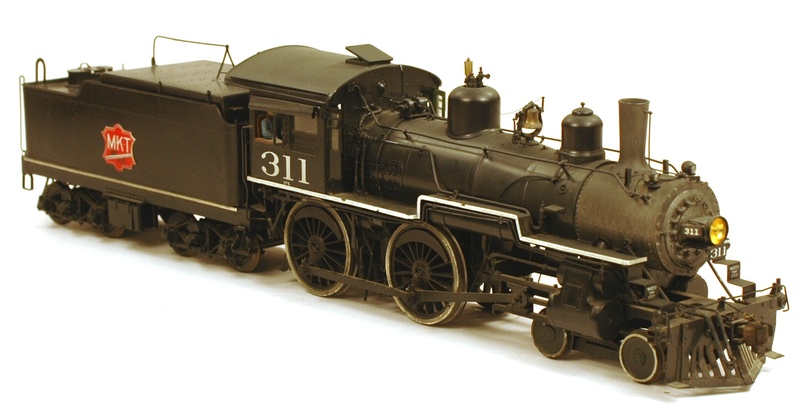 He has modeled in Sn3, On3 and O scale. At one time he organized a modelers get together called the Bull Shoot. It drew a wide range of modelers to share ideas and techniques. Bruce is a retired Union Pacific locomotive engineer and an occasional steam loco engineer on the Austin Steam Train. Thank you Bruce for sharing you experiences and photos of the wonderful model. If you have been in this hobby for any length of time, you probablt been exposed to dozens of techniques for achieving the “well worn” look to your models. 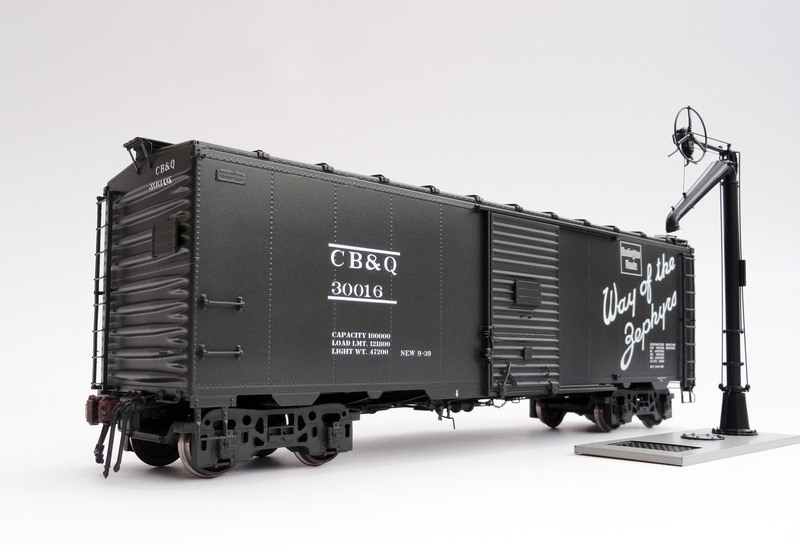 Mike George was kind enough to share how he weathers house cars for his Louisville & Nashville branch. The base coat was plain old Testor’s Gloss Brown Enamel, toned down with some white. 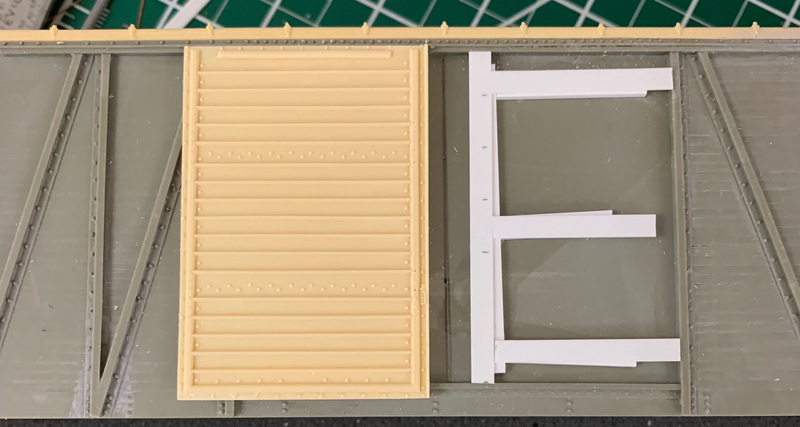 I kept that basic mixture after airbrushing the model and then added more white and more of the base brown to add the subtle differences in color on the siding. Next came a thin wash of Testor’s black followed by dry brushing with a small amount of the base color in white. Then it was finished with Dullcote after applying Norm’s excellent decals. It is Mike’s favorite car as far as weathering and overall color. It made me realize we paint most of our equipment way too dark for viewing in a normal layout room. 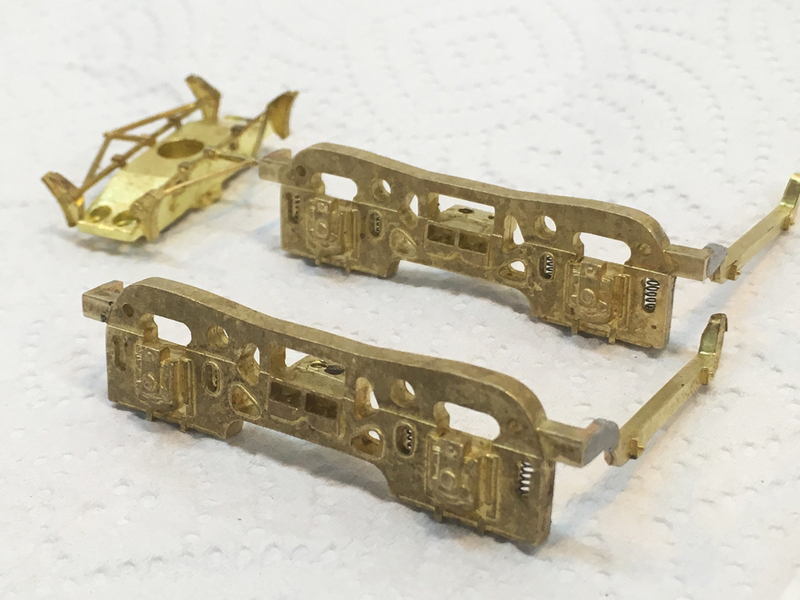 This same car is in the lead photo of the Model Railroad Planning 2019. 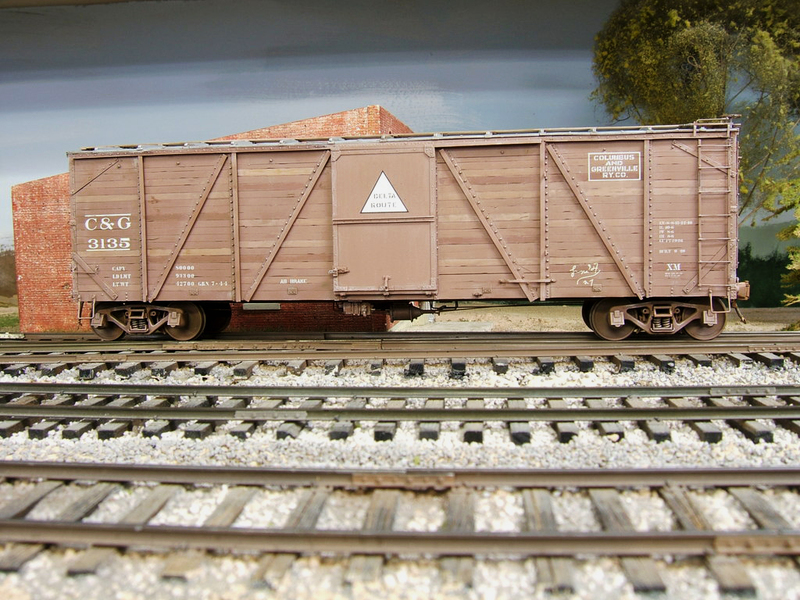 Mike has built several L&N prototype boxcars. 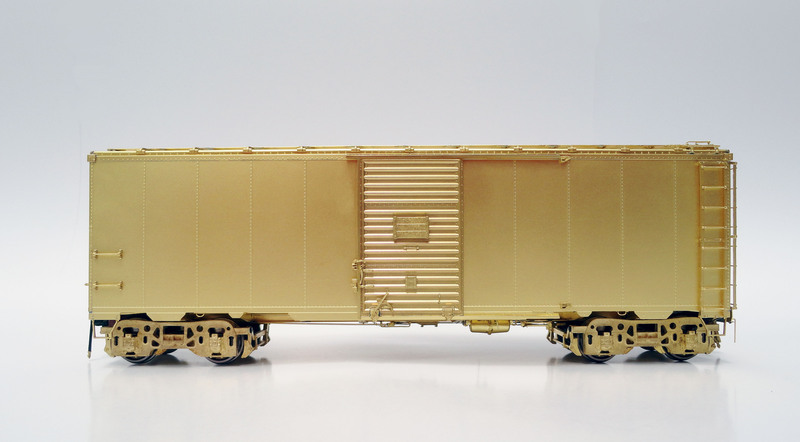 The double sheathed 36′ car is an example of his focus on prototype and using lighter colors to show all of the details. 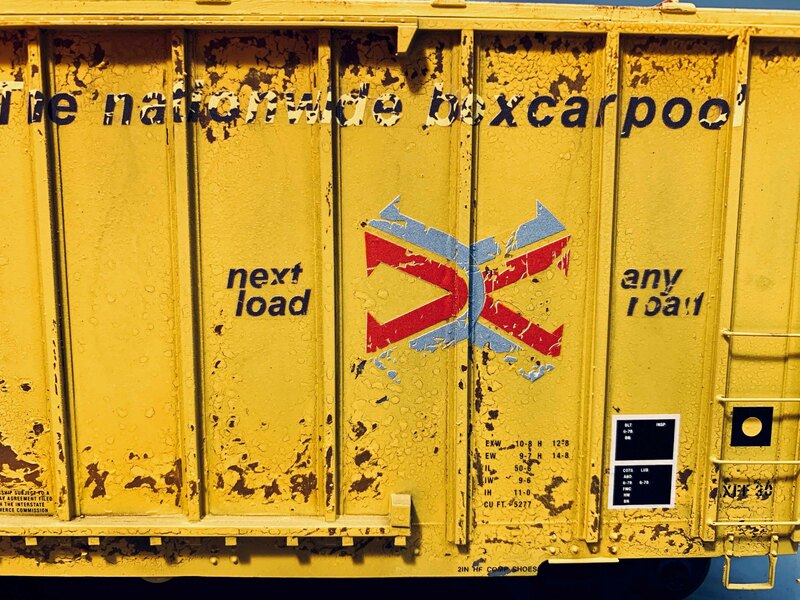 The L&N had a sizable fleet of single sheathed boxcars based upon an ARA design. Mike’s rendering of this important member of the fleet is shown below. 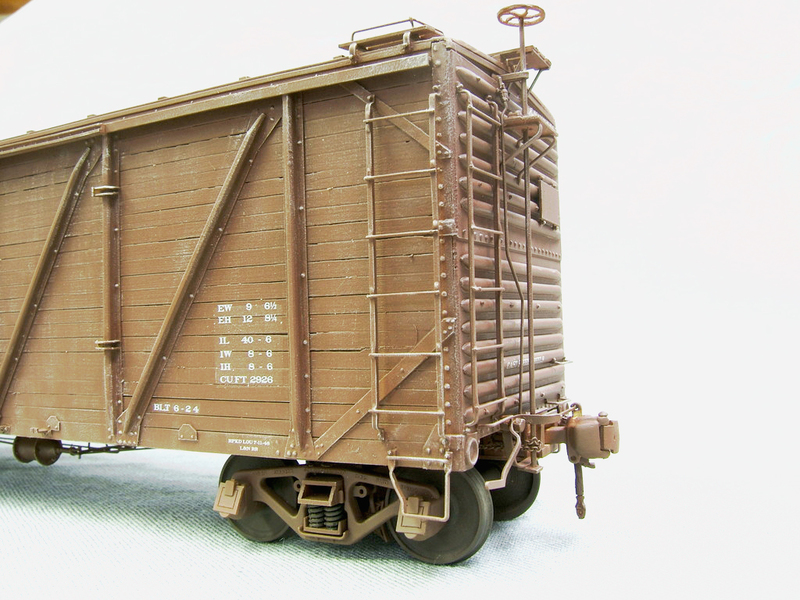 It seems that we obsess on getting the right shade of freight red or brown. Mike uses Testors paint which is readily available in a good number of store. He has avoided the costly search for certain brands of paint that is matched to car builder drift panel. I am guilty of that myself. The reality is that we need to reduce the intensity of colors for indoor viewing. Adding gray or white shifts the basic color dramatically. We all should consider buying a few basic colors and blending the appropiate shade rather than spending $$ for a one ounce bottle and more than that to ship it. Lee Turner uses about five or six basic colors to create all his wonderfuls paint jobs.